If you're in Dharamshala, you're obviously going to hit up touristy spots like Dharamkot, Triund, Bhagsunga, the Dharamshala monastery and the Church of St. John. 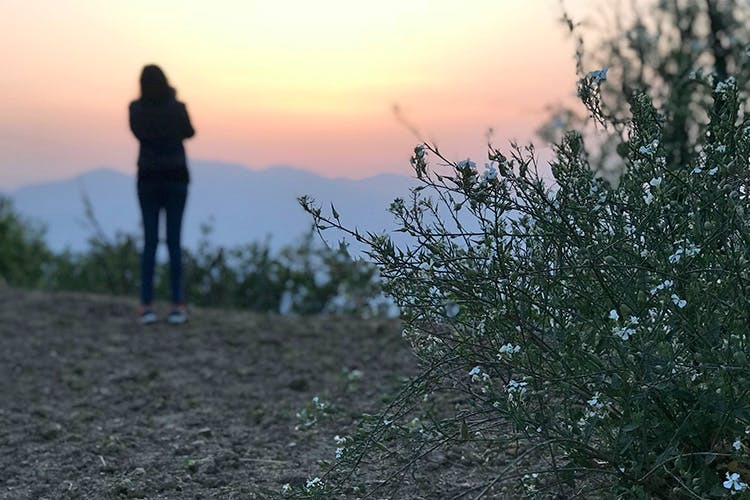 While that should, of course, be part of your itinerary, we've included a few sunset spots that are located around Mcleodganj. Indrunag is a temple situated on a hill. The place is the perfect, offbeat spot for you to spend a full day hiking, paragliding, relaxing and of course witnessing the best of sunset. You can opt to hike to Indrunag from Khanyara road or take a taxi. You get a 360 degree view of the town, which is why sunsets here are awesome. Also known as Dharamshala's backyard, you get a pretty sweet view of the sunset from this particular mall. You can simply take a cab from wherever you are, grab a snack and coffee at the mall and head out and witness the incredible sunset from this spot. A hit with photographers, sunset point at Naddi offers a breathtaking views of the Naddi village and its scenic surroundings. If you're lucky enough, you could witness a rainbow at sunset (and some light showers too). Naddi is also surrounded by scenic walking trails and, if you're a photographer, it’s a real treat.